Triple Crown Beverage Group has partnered with some of the best craft brewers around! From DG Yuengling, the country's largest craft brewer to New Belgium, one of the best in the industry, to some awesome local brewers like Alltech and Country Boy in Kentucky or Mountain State and Big Timber in West Virginia, our craft portfolio has something for every beer enthusiast. We are always on the hunt for great beers too. That’s why the craft team at Triple Crown is always on the move, visiting brewers and working hard to bring great beers to the Tri-State. The Craft Corner Blog will introduce you to all these brands! In addition, the Craft Corner will be a great resource for local interest in all things Craft Beer. From beer reviews, to food pairings, to fun swag giveaways, to hard to find specialty beers, the Craft Corner Blog has you covered. Ashland Kentucky's first beer festival was a hit despite rain clouds! 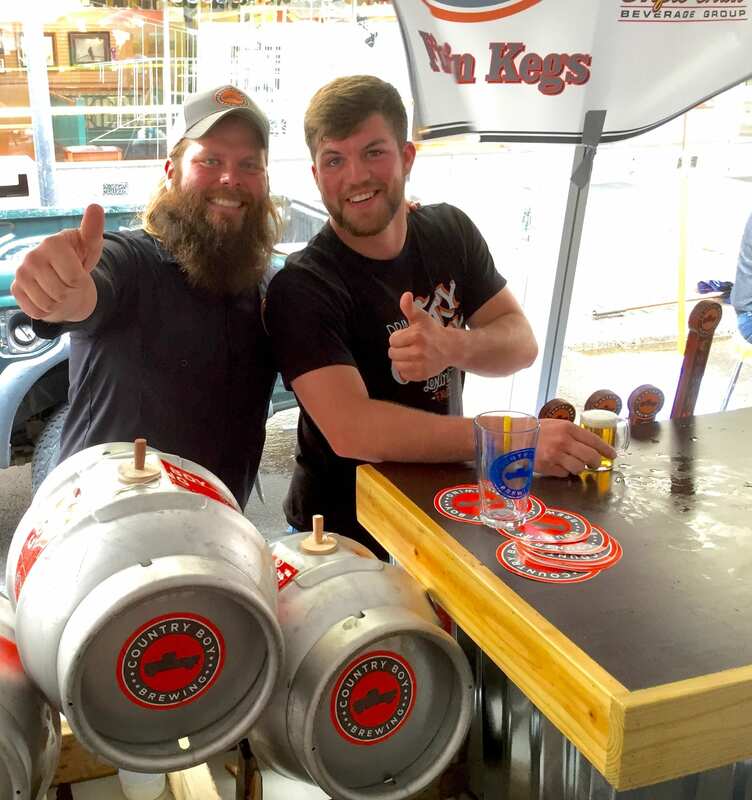 Triple Crown Beverage Group and Eagle Distributing, the only local beer distributor to service the festival had a great turnout with our brewing partners. Country Boy Brewing and Sierra Nevada both sent reps, with Lee-Anne Porter from Sierra Nevada and DH, Daniel Harrison, one of the co-founders of Country Boy. CBB's Cliff Jumper IPA with Mosaic hops took the top price of favorite beer at the festival! We also had some great beers from Goose Island, Alltech (Kentucky Bourbon Barrel Ale) and New Belgium Brewery, maker of popular Fat Tire. Triple Crown Beverage's own Rick Duelley served on the organizing committee and was pleased with the turnout. "We're just so pleased with how everything's turned out," he said. "It's a great turnout for a first-ever beer event downtown!" Thanks Tri-state for making this such a successful event! For our first Craft Corner post, we bring to you a piece from our friends over at New Belgium. In 2013, New Belgium received a shipment of new foeders, doubling the total vessels in our wood cellar to a whopping 64. This is what we refer to as the great wood cellar expansion, which involved a lot of banging on wood, riding forklifts, and careful planning. With the last foeder finally filled earlier this month, we've been feeling pretty nostalgic, so we dug up some old photos of the reassembly process, and a time-lapse video. As you can see, assembling foeders isn't exactly a walk in the park, but we're pretty darn proud of how it turned out. The foeders arrived stacked on pallets, waiting to be reassembled. Each foeder's assembled one at a time with a team of helpers. As you can see, each stave was stained by the wine previously housed inside the foeders. A closer look at the wood staining inside a soon-to-be foeder. The blueprint for the expansion. Fitting a stave into one of the taller, two-story foeders. Rehydrating the foeders helps discover leaks. And this is how we repair those leaks. View from above the finished expansion. To follow New Belgium’s Blog visit http://www.newbelgium.com/community/Blog/.